I always look forward to games that try to challenge the idea of what games are supposed to be. I like when they attempt to create a certain kind of experience through interactivity, worrying less about providing a challenge and more about making something that sticks with the player long after the game is over. Search-based Her Story is one of my favorite games ever, and Gone Home moved me in ways I wasn’t expecting. I also found a lot to like with the death-positive A Mortician’s Tale. But all these games managed to achieve their goals before wearing out their welcome. 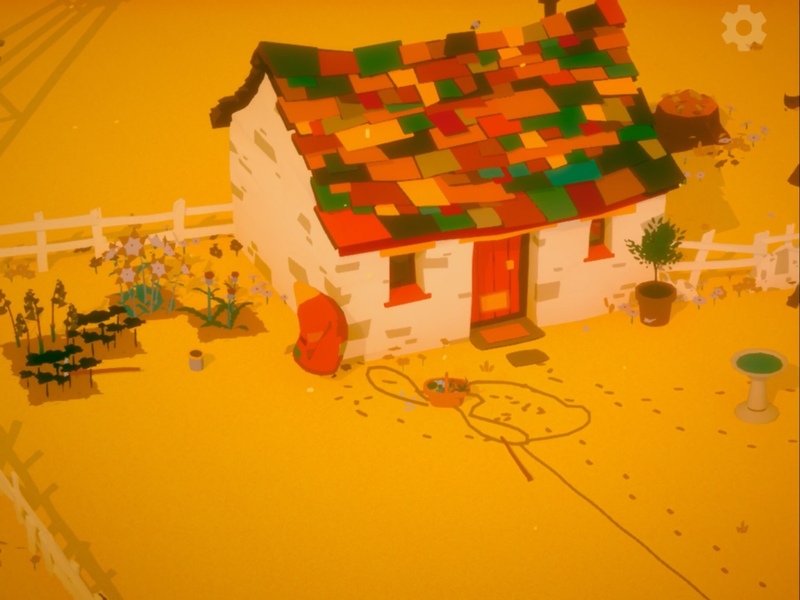 I was hoping to have a similar experience with Memory of God’s quiet farm simulator, The Stillness of the Wind, as it looked like a calm, meditative rumination about growing old and everything that comes with it. Unfortunately, it was at least two hours longer than it should have been, so I spent most of the game bored and impatiently pushing through in the hope of some grand payoff. Instead, I was merely relieved to be done with it by the time it ended, so it did not have the intended impact. 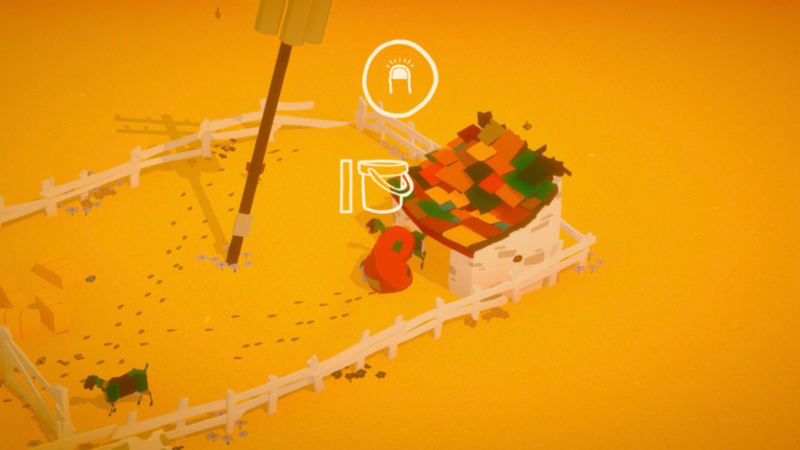 You play as Talma, an elderly goat farmer who stayed behind while everyone else moved away to the city to chase their dreams. Her only visitor is a traveling merchant who also delivers her mail every day. The farm consists of her small house, a churning hut, a goat enclosure and some chickens running around. There’s also a well for fetching water needed to grow crops. The game starts off promising. It’s pleasant to look at, with the rich yellow sand and multicolored shingles of the roofs. For a melancholy game, the color palette is surprisingly cheerful. The soundtrack is a perfect fit, as it’s somehow a mix of calming and grandiose, like something big is going to happen. 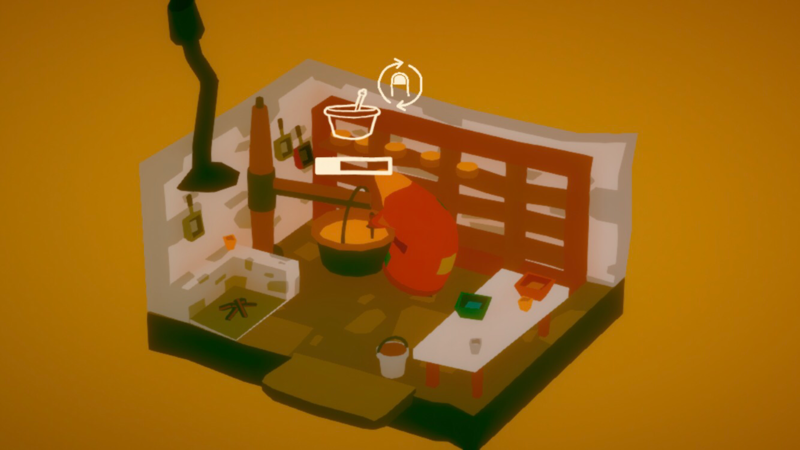 A few on-screen instructions teach you the basic controls, like tap to pick up and double-tap to put down, but you’re mostly left to your own devices to experiment and see what items do. Since the churning hut is the biggest thing around besides her home, you’ll likely try to explore that first. And then you realize you need some milk to make cheese. It’s not too hard to guess from there that you need to grab the bucket and use it to milk a goat. Soon, you’ll be on your way to making your very first cheese wheel, one of many — unless you decide to ignore what the game seemingly wants you to do and forgo your cheese-making duties. You can also fill your basket with eggs from the chickens, sow some soil and plant the seeds from your pockets. Getting water from the well takes some time and effort, since it’s outside the enclosure, but it’s necessary if you want to grow anything. 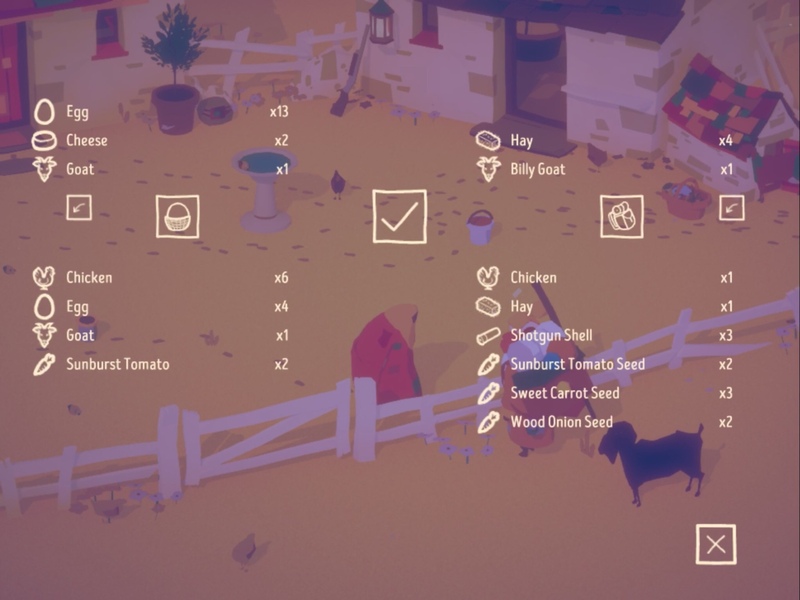 If you have enough cheese, eggs, and produce, you can try bartering with the merchant when he stops by, though it’s not very obvious at first how. He won’t tell you what each object is worth, so you have to offer up different items until he accepts the trade. Cheese tends to be worth a lot more than eggs, but they also require a good deal of patience to make day after day — and goats willing to be milked. When it gets dark at the end of the day, Talma can go inside her home and read a book or her letters, cook some dinner and then go to sleep for the night. Besides that, there’s not much else to do. You can wander into the desert outside the farm and pick some mushrooms to sell, but there’s nothing else out there besides a few rocks. On my first go at the game, I left the gates open and my goats escaped, so I tried to go off looking for them and decided to stay out and explore. That’s when I hit a nasty bug that prevented me from walking back to the farm. Since I wasn’t deep into the game, I figured I’d restart and this time take better care of my goats. But it also meant that I was afraid to venture out again in case I met that awful bug. I finally took the chance one morning, since I knew the game saves at night. I managed to slowly make it back to the farm without any glitches, but I discovered that time stands still out in the wilderness. You can stay out there as long as you want and the sun won’t set. This was about the time where I started wondering whether anything I do matters, or if I could just stand around and do nothing all day. Does it even make a difference if Talma or the goats eat? I began to think that maybe nothing mattered. And the days were piling up. So many days. I did not expect the game to last so long — two hours tops. The goats kept getting stuck on the fence, preventing me from milking them. At one point, the game thought I was trying to pet a goat even though I was holding the milk bucket. And another time, I interrupted my milking by accident and couldn’t resume it. I then got stuck in the churning hut all because my pail wasn’t full. For a while, I forgot that I needed to take my basket of eggs and produce inside for the night or they would just disappear. So I wasted days and days of eggs and vegetables. But did it even make any difference? I was also confused by the game’s strange goat economy that seemed to limit me to two goats at a time. If the merchant says you can borrow his billy goat to breed with one of your female goats, what he seems to mean is that he’ll lend it to you if you give him one of your goats to keep. I’ve never been able to get him to give me his goat without offering one of mine up. But after the two goats do their thing and your remaining goat gets pregnant, his goat disappears. When the baby’s born, you’re back to two. So he just keeps getting free goats from you. It’s not a big deal, but it’s just one more silly thing that kept me from taking the game seriously. My patience wore thin, but I was still a little worried about messing up and possibly having to start over again. I still had a sliver of hope that there would be some payoff for all this effort. So I continued making cheese, collecting eggs, trading with the merchant. But then I’d sometimes miss the merchant by literally one second because I was by the well when I heard him coming and couldn’t move fast enough. It’s frustrating that there’s a warning when he comes, but he doesn’t stick around long enough for you to get to him if you weren’t already standing nearby. Luckily, he’ll drop off any letters in the mailbox so you don’t miss those. But it took me a while to realize I had to access it from the outside, so I thought it was bugged when I couldn’t get my mail from inside the enclosure. These are all little things that so unnecessarily make the game more tedious and confusing than it needs to be. I dreaded each time I sat down to play because it didn’t feel as polished or intuitive as it could have been. I probably would have been fine with all these things if I only had to put up with them for an hour. But three hours is far, far too much. The letters that arrive are from friends and family who moved away, giving you details about their new life, as well as what’s going on in the world that you’re cut off from. They also recollect things of your shared past, filling in the story in an attempt to bring these people to life. The problem is, they don’t sound like real people. The writing is long-winded and pretentious. 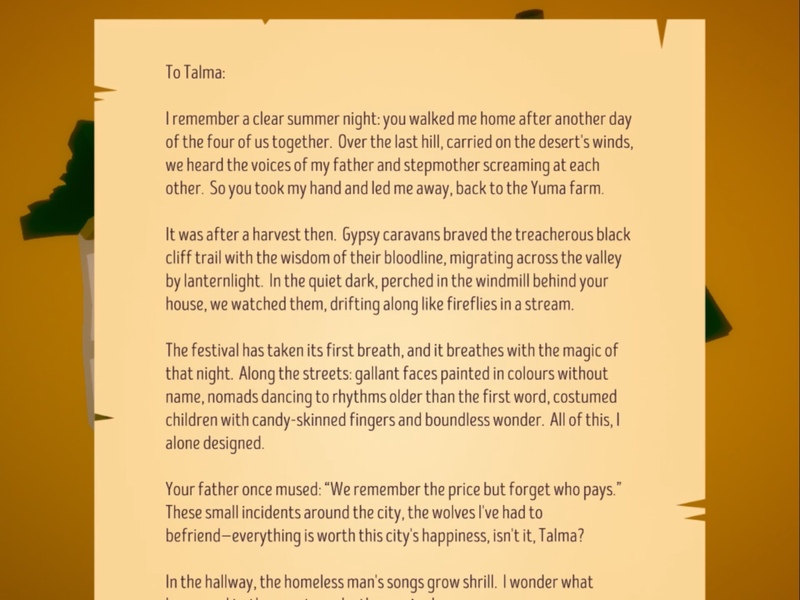 Talma’s brother writes in purple prose, but we learn that he always wanted to be a poet. So I could forgive his lofty language. But that doesn’t explain why all the other characters write in almost the same way. Everyone Talma knows writes to her like they’re poets. It’s hard to connect with them when all they seem to be doing is trying to find the most elaborate way to describe every little detail. It’s a shame, because I was more interested in the story than in churning milk, but the way it was written made my brain turn off before I absorbed the information. Both Gone Home and A Mortician’s Tale told much of their stories through letters. But they were written in a way that came off natural and brought the characters to life. Each one had their own style that gave them personality. In Stillness, I often couldn’t tell who the letter was from without reading the name at the bottom or noticing the reference to “sister” or “brother.” I would have to re-read them just to register what was being said. The result was that I never made a connection to anyone and that only made the long, boring grind of farming day after day after day even more unbearable. I loved Gone Home as is, and appreciated that it let you go at your own pace and decide how much you wanted to see. You could either rush to the end or take your time and learn more about the family. And I had some minor complaints with A Mortician’s Tale, mostly to do with wasted potential. But I still enjoyed it for what it was, found the writing strong and the game’s length perfect. It didn’t overstay its welcome and have me doing the same tasks over and over for hours. In Stillness, I can only churn cheese so many times before I want to hit something. But I tried standing around doing nothing, ignoring my goats and chickens, and it just made the wait feel even longer. It didn’t seem like there was anything I could do to speed up the game. When it comes down to it, my biggest issue with The Stillness of the Wind is its length. Had it been a brief, contemplative game telling its story in a timely manner, I might have been moved by it and even recommended it to others. I don’t even have a problem, necessarily, with the survival aspects being a facade and not really mattering. It’s the fact that the game lasts three hours, and it doesn’t seem to matter what you do in that time. I could handle thirty to sixty minutes of fake survival to tell a story. But at some point, you start to wonder why you’re bothering at all and just wish the game would end. Even walking off into the distance or standing around doing nothing for a day or two to test the game’s limits isn’t very satisfying when there seems to be endless days ahead of you. There comes a point where the simulation of tedium ends and real tedium sets in. I’m disappointed, because there was a ton of potential here, the game looks and sounds amazing, and I so wanted to be moved by it. But in the end I just feel like I wasted three hours doing nothing. If you have a lot more patience than I do and still want to give it a chance, you can download The Stillness of the Wind here. But don’t say I didn’t warn you about those f***ing goats! And if you need help figuring out how to use the different tools, try my walkthrough guide. Yeah I got the bug with her walking into the desert and unable to return a little into my first game so I restarted. And then I was afraid to go exploring in case it would happen again. Very buggy game.